The capsule which carried Kara Zor-El from Krypton has arrived on Earth... but in this reality, on this Earth, it is a different caped figure who has recovered the teen who will be Supergirl. Now, as the newly awakened Kara copes with the trauma of having watched her world die, Teth-Adam - the dictator known as Black Adam - must repel the invasion of a neighboring country who would claim Kara and her ship for themselves. What Injustice 2 #11 lacked in originality (being a basic retelling of Supergirl's origin story with a few more scenes expanding upon the House of El beforehand), this twelfth issue more than makes up for. Taylor's conceit of having Black Adam save Supergirl and tell her of her famous cousin is a brilliant one. I must balk somewhat at Adam describing Wonder Woman as Superman's love (I don't believe their relationship ever became a mutually romantic one in the original comics or game) but that may be presumption on Adam's part rather than the truth of things. I wish Mike S. Miller's artwork was entirely the equal of the story this time around. 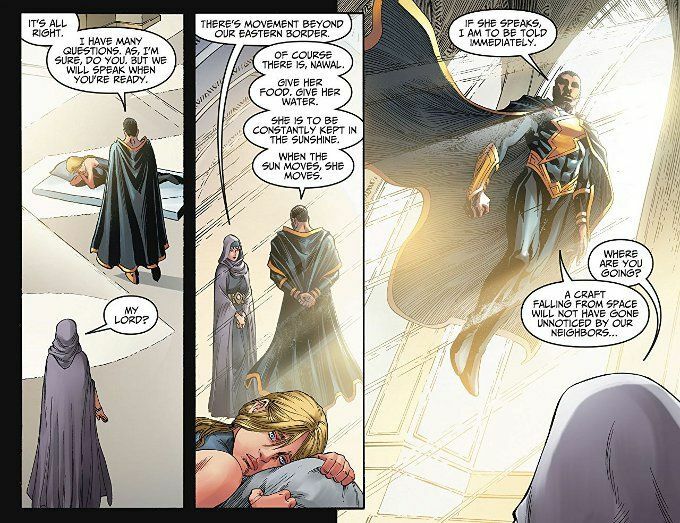 Miller's artwork isn't bad and he does present some truly breathtaking visuals, such as the page above which ironically depicts Black Adam as an angelic figure. Unfortunately, several pages seem severely under-inked and some of of the facial expressions just look odd. The Final Analysis: 7 out of 10. A serviceable issue, but not without some minor flaws.